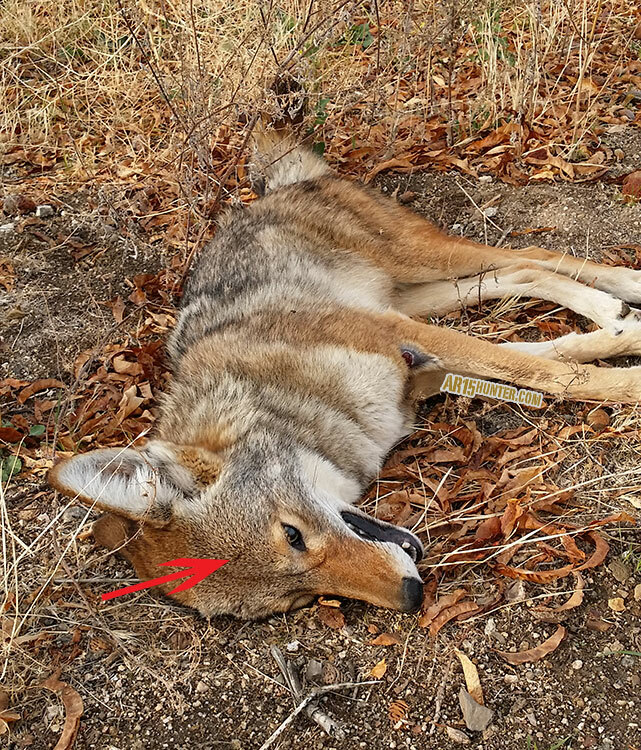 As most everyone knows, there is a portion of California that requires hunters to use lead-free bullets when hunting game and “non-game” animals, including predators like coyotes and bobcat. Hunters here call it the “Condor Zone”. Now that we’ve had the Condor Zone in effect for quite a while, we are now realizing that forcing hunters to use lead-free bullets has done nothing to prevent the Condors from finding other ways to ingest enough lead to kill themselves. Unfortunately, as California seems to always do on bad decisions, they doubled down and banned the use of lead bullets outright in the entire state, with full implementation to be phased in by 2019. So, to finally get back behind my Remington R15 (.223 – AR15), I decided it was time to take a look at a couple of the lead-free factory options for predator and other varmint hunting. 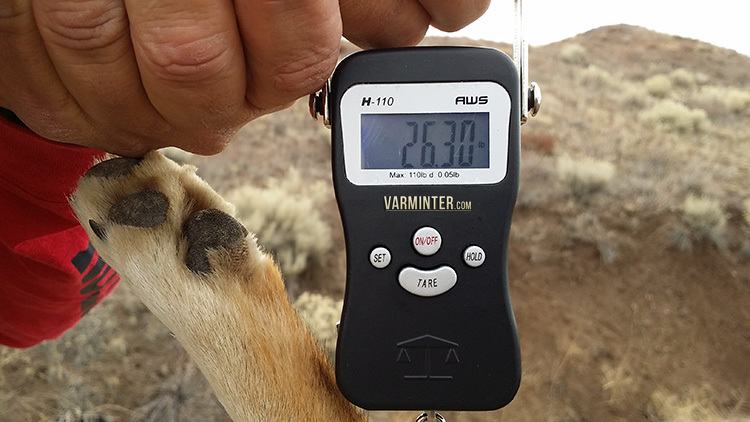 The trick was to find something that was actually available, while also being accurate and lastly one that would put down a smaller Southern California coyote quickly and cleanly. No hunter I have ever met, nor hope to ever meet, wants to wound, or prolong the suffering of their intended target. Therefore, these bullets had to have enough punch to get in the animal, but at the same time, be fragile enough to blow-up inside the animal and destroy the vital organs. I ended up choosing both the Winchester 35 grain Ballistic Silvertip Lead Free and the Nosler Custom 40 grain Ballistic Tip Lead Free to try first. 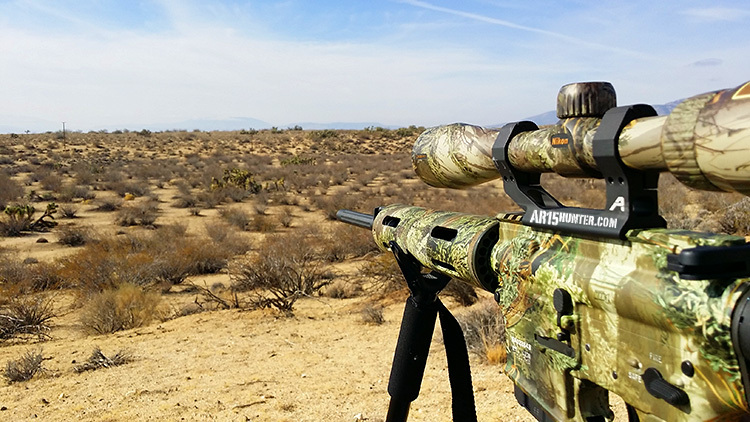 Although I prefer bullets in the 50 grain range for most of my coyote hunting, I knew that the majority of my shots here in SoCal would have a maximum range of only about 200 yards and it would be on much smaller animals than I shoot up north. So I felt that the 35 to 40 grain bullet would be sufficient. Since my choice was made, it was now a matter of which one performed best in my rifle while at the bench. The Remington R15 is known to be an accurate rifle, with mine being one of those that seems to love everything I feed it. These two factory loads were no different. Each shot extremely well, with the edge going to the Winchester 35 grain Ballistic Silvertip, which came in just under 1 inch at 100 yards. There was no way I could miss a coyote with those results, unless I screwed up the shot! We finally got some cooler weather here, so I headed out to do some calling, eager to see how the lead-free bullets would perform. It would be different this time, as I decided to leave the cameras in the truck so that I could concentrate on hunting. I did a total of five stands that morning, two by myself and the others with my cameraman, Tom, who was carrying his old single-shot 10 gauge and some Bismuth shells. The first was at dawn in an area known to hold bobcats, as well as coyotes. Unfortunately, the only response I got was three very loud feral dogs that came crashing through the trees to get a look at the caller. 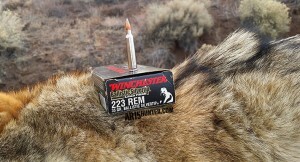 The second stand produced a hard charging coyote that made a quick right when it caught Tom’s scent in the swirling wind. We both woofed it to a stop, but I missed an almost gimme shot at 150 yards. I admit I was rusty with the R15, and the next few stands didn’t give me a chance to redeem myself. Tom had some other stuff to do in the early afternoon, so I dropped him off and headed out on my own for one last stand. I headed to another area of the old orchard from that morning and pulled into an area that was loaded with sign. As I was driving in, I spotted a lone coyote at the end of one of the rows working its way slowly through the trees, going in the opposite direction. I kept driving and parked my truck far enough away where I would not spook the coyote. 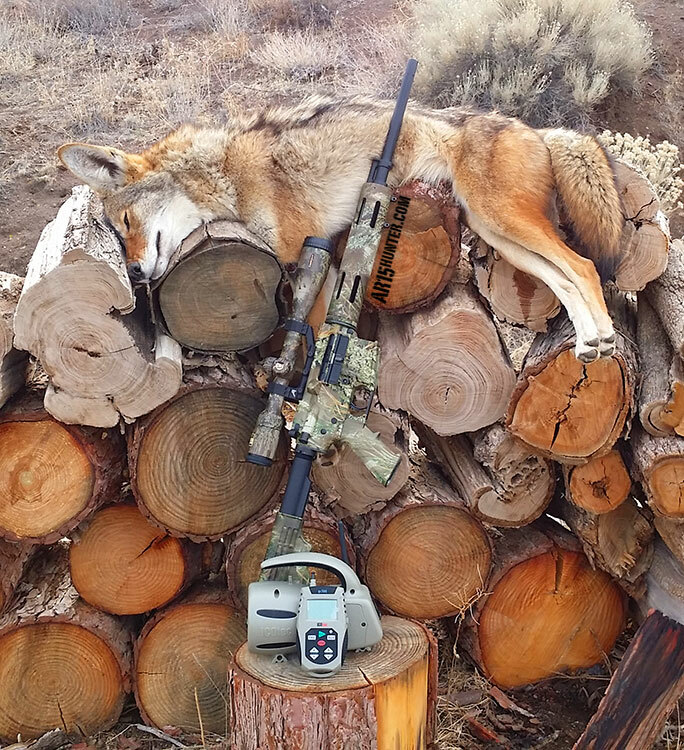 We had been using my Foxpro all day, so this stand I grabbed an ICOtec GC500 caller I also had with me, along with my R15 and a shooting stick, then headed towards the area I saw the coyote. 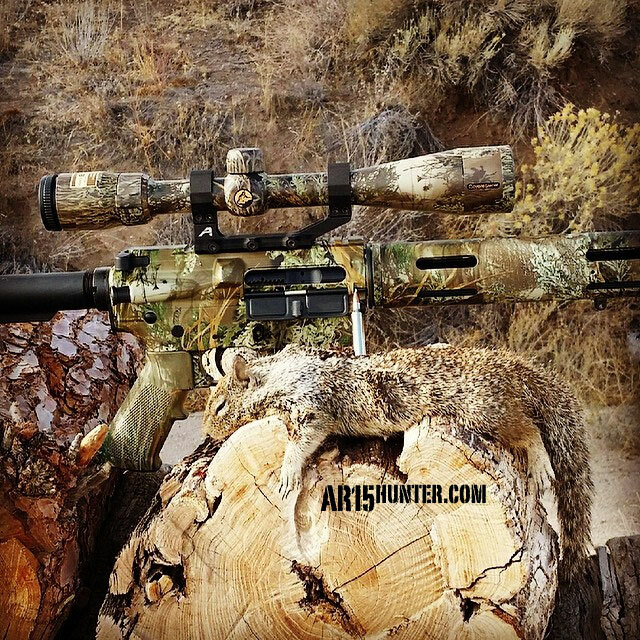 When I got to the edge of the trees, I set the caller up about 40 yards away and propped myself against a tree with my rifle pointed down one of the rows of trees. I waited a few minutes, then started the call with a very quiet jackrabbit sound. Within a few minutes, I saw the coyote come sneaking through the trees, hesitant to come out into the open row where I sat. After about 30 seconds, the coyote popped out of the trees at about 95 yards, but not enough to give me a clear shot. It was still wary to come to the call, but watching it through the scope told me it was fixated on the cries of the jackrabbit it thought was dying a mere 50 yards away. Finally, it put it’s head down, came out in the open a bit more and started towards me. I put a bullet into its head at 92 yards and it dropped, stone dead. I waited a few minutes to see if there was another coyote in the area, then headed over to see the results. 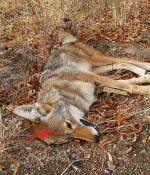 The coyote had fallen exactly where it stood and did not have a spec of blood showing anywhere. The only evidence of the shot was a small amount of brain matter that was oozing out of the hole in its head. The 35 grain lead-free bullet hit hard and did not exit, actually blowing up in the brain and brain stem. I headed back to my vehicle, picked up the coyote and headed over to another spot to take a few more pictures and weigh it. This coyote was a female that weighed out at 26.3 pounds, which was a bit larger than a coyote taken in the same spot earlier this year (20.45 lbs.). We tried some calling the next morning, but were blanked at every stand. I spent a bit more time shooting groups before heading home (along with a couple of ground squirrels that dared show themselves while doing so!). 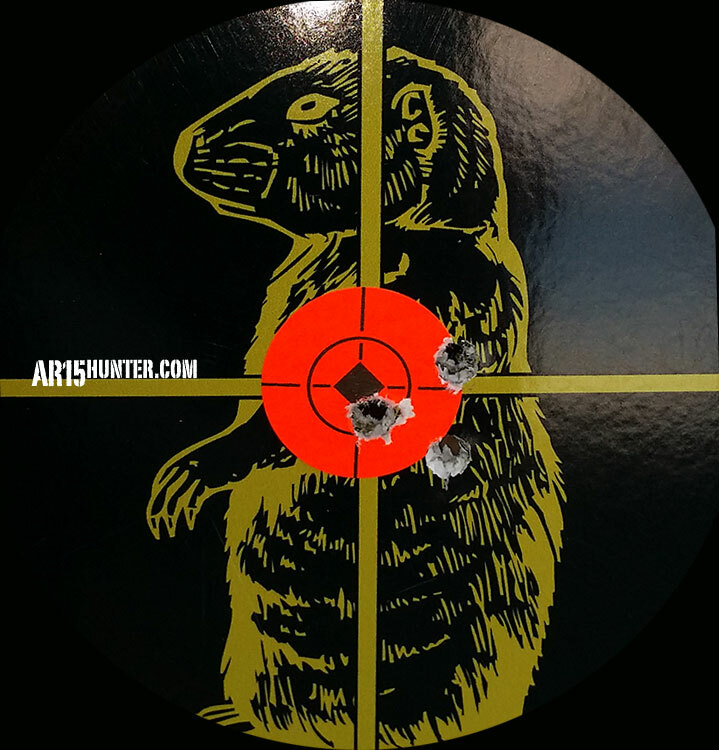 I was consistently getting sub-moa groups with the Winchester 35 grain Ballistic Silvertip rounds, so I plan to use those for the rest of the season, whenever I am using my Remington R15. Hopefully, this will be a round that Winchester continues to offer, but if not, the Nosler offering would be a good runner-up in my rifle. This California Coyote hunt with lead free .223 ammo turned out well and shows there is a lot of effort on behalf of the ammo companies to make sure California hunters are not out of luck when the full ban takes effect in 2019.